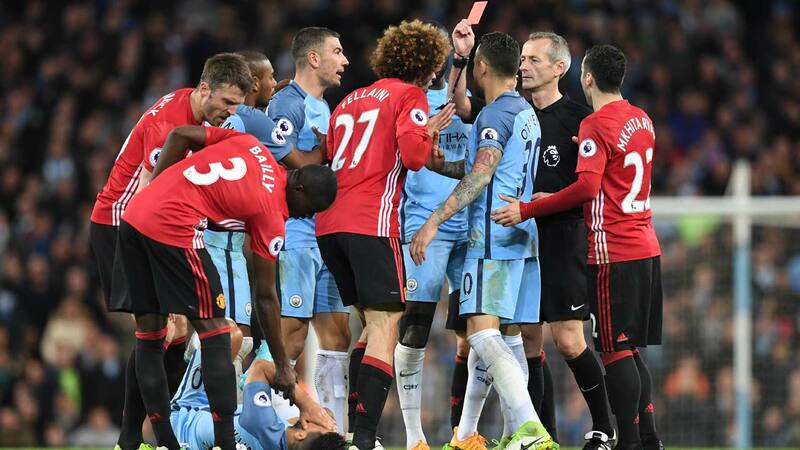 Marouane Fellaini was sent off for brainlessly headbutting Sergio Aguero as Manchester United’s Champions League push was frustrated in a 0-0 draw at Manchester City on Thursday. Booked for tripping Aguero in the 85th minute, Fellaini fouled him again seconds later and then blatantly butted the Argentinian, leaving referee Martin Atkinson no option but to send the Belgian off. City remain fourth, a point behind third-place Liverpool with a game in hand, with United — who also have a game in hand on Jurgen Klopp’s side — a point further back in fifth place. While United are now unbeaten in 24 Premier League games, equalling the club record, they squandered an opportunity to supplant City in the top four after a forgettable stalemate at the Etihad Stadium. Despite controlling the game, City came no closer to scoring than an early Aguero effort that hit the post, while substitute Gabriel Jesus had an injury-time header disallowed for offside. City also lost goalkeeper Claudio Bravo to an apparent calf injury, sustained as he caught a high ball, with Willy Caballero taking his place for the last 14 minutes after Bravo was stretchered off. City remain on course for a top-four finish, their last remaining objective after last weekend’s FA Cup semi-final loss to Arsenal consigned Pep Guardiola to his first trophy-less season as a coach. Jose Mourinho’s United could yet qualify for the Champions League by winning the Europa League. But in the main, Thursday’s drab derby served to illustrate why the Manchester rivals are scrapping over fourth place rather than fighting for the title. With Paul Pogba injured, Mourinho aligned a conservative midfield trio of Michael Carrick, Ander Herrera and Fellaini, setting the tone for a tetchy, attritional contest. Marcus Rashford returned in one of four changes and while his lightning pace enabled him to leave Nicolas Otamendi for dead repeatedly, the teenager cut an isolated figure. The football that managed to emerge above the midfield melee was almost all City’s. The hosts hit the woodwork in the ninth minute, Aguero cushioning a volley against the base of the right-hand post from Kevin De Bruyne’s right-wing cross. United goalkeeper David de Gea fielded curlers from De Bruyne and Aguero and saved at his near post from Aleksandar Kolarov, while Aguero and Raheem Sterling arrowed shots over the bar. But there were two moments of unease in the hosts’ box, the first when Bravo clawed Anthony Martial’s cross into the path of Henrikh Mkhitaryan, whose shot he was then obliged to block. Shortly before half-time, Rashford’s free-kick from the left found Herrera unmarked at the back post, but the Spaniard headed wide. City continued to force the issue after the break, but United, expertly marshalled by Eric Bailly and Daley Blind, kept them at bay. De Gea comfortably saved from Sterling, twice, and Aguero, while De Bruyne ruffled the side-netting with a low drive after cutting in from the left. Otamendi looked poised to break the deadlock when he rose to meet Kolarov’s corner, but Bailly diverted his header over the bar. Fellaini’s dismissal gave City the edge and Guardiola immediately introduced Jesus, back from a broken foot sustained in February. The Etihad erupted when the Brazilian headed in from Aguero’s cross, but an offside flag silenced the home fans and a stretching Aguero could only volley wide from De Bruyne’s cross moments later.